The London 2012 Olympics mark a watershed in behavior with 90 per cent of the UK’s population following the Games through a combination of TV, PC, mobile, tablet and social media. Millions used media in a new way for the first time, according research from Starcom MediaVest Group who asked 1,010 adults (aged 18+) across Great Britain how they followed the Games. With 2,500 hours of live coverage made available across over 24 dedicated video feeds, 21.9 million viewers tuned into these additional streams during the Games via interactive TV and online. 6.6 million viewers used the Red Button function for the very first time. 27 per cent used PCs or laptops to read news reports, but almost as many (23 per cent) watched either live or catch-up video online, showing a distinct change in the way computer screens are being used. Dubbed by many as the Twitter Olympics, new behaviours emerged over the Games with 2.7 million reading or posting about the Games on social media sites at the same time as watching them on television for the first time. 6.4 million GB adults used social media to read about what was happening during the Games – although this was far more popular with younger viewers, with 47 per cent of 18-24 year olds following the Games in this way. 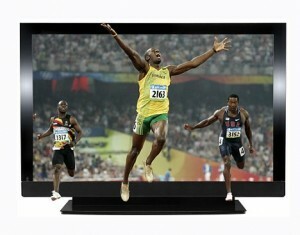 TV came out on top with 41.0 million watching televised events and 38.8 million watching live footage. Newspapers and radio proved their ongoing appeal, with 46 per cent reading about the Games in a newspaper and 29 per cent hearing about them on the radio.